TOKYO, January 18, 2017 – Ricoh today announced the acquisition of Avanti Computer Systems Limited (hereinafter “Avanti”), a leading provider of Print MIS (Management Information System) targeted for the production print market. This acquisition enables Ricoh to further expand the value its production print workflow delivers to customers, as well as to help improve management efficiency and productivity of customers in the production printing market. In July 2013, Ricoh made a strategic investment in Toronto-based Avanti, which established the foundation for this acquisition. Award winning Avanti Slingshot solution is one of the most advanced JDF*1-certified Print MIS available in the market today. JDF is the industry standard for process automation in pre-press, press and post-press. This latest Ricoh acquisition continues Ricoh’s dedication to providing customers with an unmatched, best-of-breed portfolio that addresses the needs of the production print market, today and tomorrow. Previously, Ricoh acquired MarcomCentral (formerly known as PTI Marketing Technologies Inc.), in December 2014. The acquisition has successfully enhanced the value of Ricoh’s Web to Print, Marketing Asset Management, and Variable Data Printing offerings. 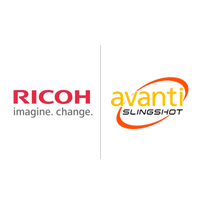 With the addition of Avanti, the Ricoh portfolio is now able to cover the entire production workflow, including Print MIS. Ricoh is aiming to link the Avanti system not only with the RICOH Pro Series, but also with other company’s products, for providing customers with wider solutions. In addition to production workflow, Ricoh has started to offer marketing workflow services, aimed to further print shops’ value proposition to their end customers. By collaborating with its partner companies, Ricoh also aims to form an industry-leading ecosystem that will continuously provide customers with increased value-added services. *1. JDF stands for Job Definition Format. © 2017 RICOH COMPANY, LTD. All rights reserved. All referenced product names are the trademarks of their respective companies.